When information is passed from one person to the next, things can become confused and distorted. This is especially true when we are in a hurry or we don’t know the whole story. If we are in a hurry, we leave out important facts; if we don’t know the whole story, we may fill in the blanks with information that may or may not be true. Either way, the story becomes farther and farther from the truth. If someone wants to know the truth, they need to go to the original source and find out what they want to know. We should never completely believe anyone who is relating information to us second or third hand unless we can verify the information in some manner. 20 toothpicks for every three people in the class. Divide your class into teams of three. Have each team create a design using up to ten various colored toothpicks and up to ten various colored marshmallows. The designs must lay flat on the table or floor. The design should be two dimensional rather than three dimensional. As the teams are creating their design, they need to set aside the same number and color of marshmallows and toothpicks they used to build their design. Have them put these into a small sack (or Bag). 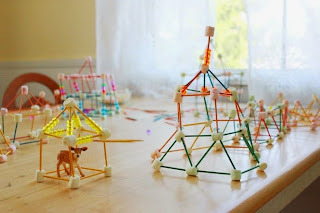 This set of marshmallows and toothpicks will be given to the builder on the team that must recreate that particular design so he will have the right material to work with. Once all the teams have created a design, explain that each team must designate an explainer, a messenger and a builder. At this point have the explainers go and sit by a different team’s design. Do not let any other member of the team see this design. Send the builders to the other side of the room and give them the sack of marshmallows and toothpicks that corresponds with those from the design where the explainer is now sitting. Have the builders sit facing away from the explainers so they cannot see the design that they will have to build. If you have limited space they can sit back to back. The messenger goes to the explainer. Have the explainer positioned so the messenger cannot see the design. The explainer will tell the messenger what the structure looks like. Then the messenger goes to where the builder is located and without being able to see what the builder is building, he relays what the explainer has told him about the design. The messenger may make as many trips back and forth between the explainer and the builder to get instructions or ask questions as he/she wishes. At no time may the messenger see the actual design the explainer has in front of him or the design the builder is building. Questions may be asked, but looking is not allowed. When each team has finished recreating the design they have been assigned, have the entire team get together and see how closely they were able to duplicate the original by using only verbal instructions.